Ealing Council has scooped two awards for its work to develop an innovative new lorry safety system which warns drivers when cyclists and pedestrians are likely to collide with a vehicle. It won the Fleet Safety Analysis and Action category at road safety charity, Brake’s awards on Thursday, 1 October. In September, London won the award for best Innovative Transport City at the Transport Innovation Deployment for Europe (TIDE) event for Ealing Council’s cycle safety work. Ealing developed the technology with the system’s manufacturers. Cycle Safety Shield is the first of its kind to use intelligent cameras to filter out inanimate objects, such as bus stops and fences, to monitor and detect only pedestrians, cyclists and motorbikes and eliminate blind spots 360 degrees around the vehicle. An alarm will only sound to the driver if a cyclist or pedestrian becomes too close to the vehicle. 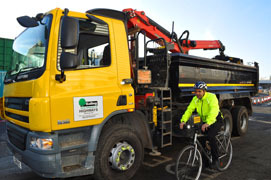 Using Transport for London funding, the council is currently installing the Cycle Safety Shield System on all of its large goods vehicles. Its highways and recycling and waste contractors Murrill Construction and Amey are also rolling out the system on their vehicles. This follows a trial of the system in 2013 and 2014 which showed that 15 potential collisions with cyclists had been avoided and driver behaviour had improved by 20 per cent. The trial also demonstrated that improved driving saved £1,000 in fuel costs on each vehicle per year.